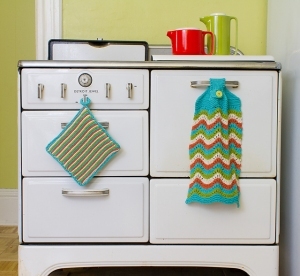 Taken from Juniper Moon Farm Patterns- The Stria Collection: "This classic kitchen set is perfect for summertime knitting in a cool cotton yarn with bright and fun colors!" This pattern is from Juniper Moon Farm Patterns- The Stria Collection - Old Shale Towel & Potholder. Size US 6 & 7 straight needles (or size needed to obtain gauge), a size G Crochet Hook, one 3/4" button, a 1" plastic ring, and a tapestry needle are required but not included. Finished Measurements: Towel - 10.5" x 15", Potholder - 7.5" square after blocking. Gauge: 22 sts & 30 rows over 4". Colors Shown are #05 Aruba, #01 Sandbox, #07 Morning Glory, & #08 Tree Frog.